A Firefox 1.5 changelog. Cool feature: tab/address bar icon when viewing an image is thumbnail of said image. CSS3 support is moving along, but what about multiple backgrounds and text-shadow? Yahoo has been busy trying to lure me away from Google. Konfabulator Yahoo! Widget Engine is updated. Comes with some new Yahoo! widgets that integrate with their other services like Calendar, Notepad and Contacts. I haven’t put the features to use though yet and am not so sure I will. In some ways I’d prefer to keep my desktop separate from the web and at this point I don’t use any of the Yahoo on their own so none of my data is available anyway. Maybe after playing with it a bit I’ll decide to move over. Yahoo also has a new (beta) map service and APIs. It’s done up in Flash. The interface seemed really nice for the short time I played with it before experiencing technical difficulties (not sure what is to blame – Yahoo, Firefox, Microsoft or myself). I really like the zoom/view finder. Their Flash implementation seems to allow for some nice transition effects in zooming that makes the experience seem a bit more responsive than Google’s current AJAX method. Play with it a bit. Finally, seems Yahoo now owns del.icio.us. Hopefully there won’t be too many changes. speaking of yahoo and firefox, i saw an article on yahoo that the new version of firefox has a few security problems and the essential patches aren’t going to be ready/available until early to mid january. haha. now i’m off to test the yahoo maps. Speaking of Yahoo! 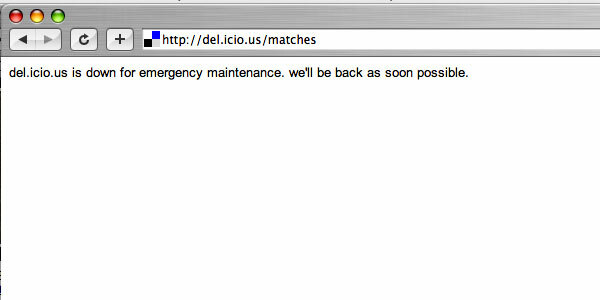 and del.icio.us, I’ve had more downtime this week than I’ve had before, ever.